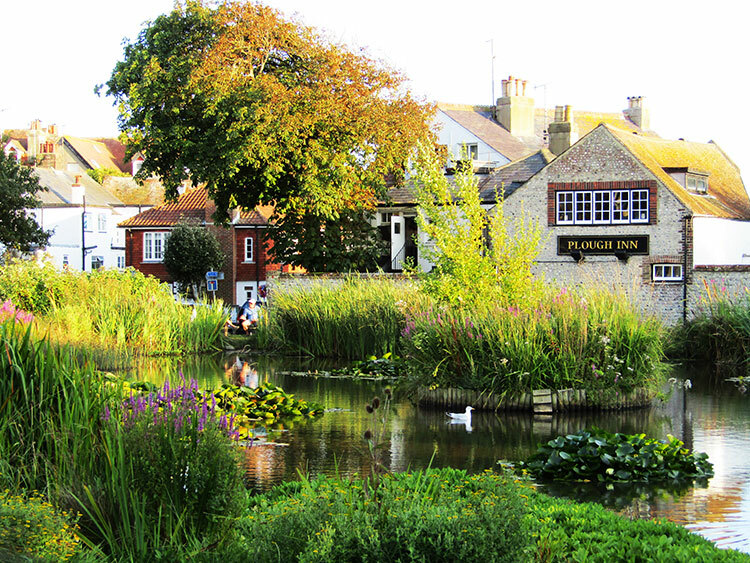 The Plough Inn is an impressive brick building standing proud next to the picturesque duck pond and village green at the heart of pretty Rottingdean. 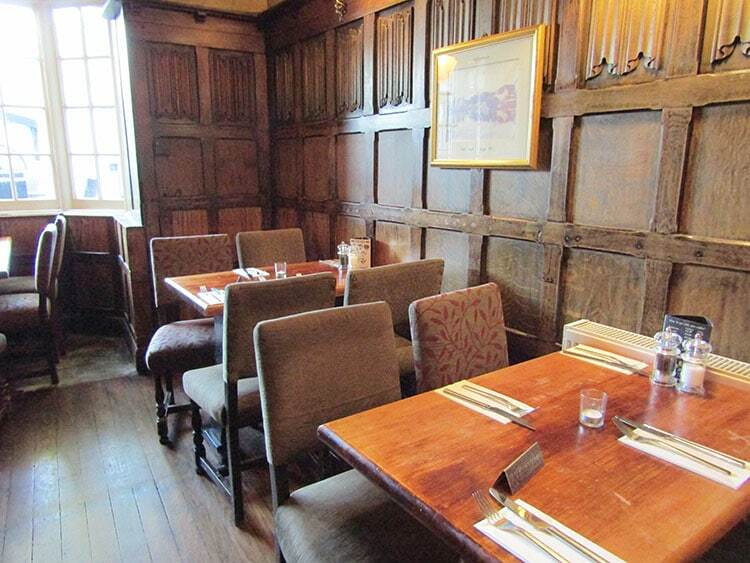 The pub originally dates back to the 1840s and is surrounded by beautiful old houses steeped in history. Despite the fact that it looks like parking should be tricky, we managed to find spaces within easy walking distance both times we visited. 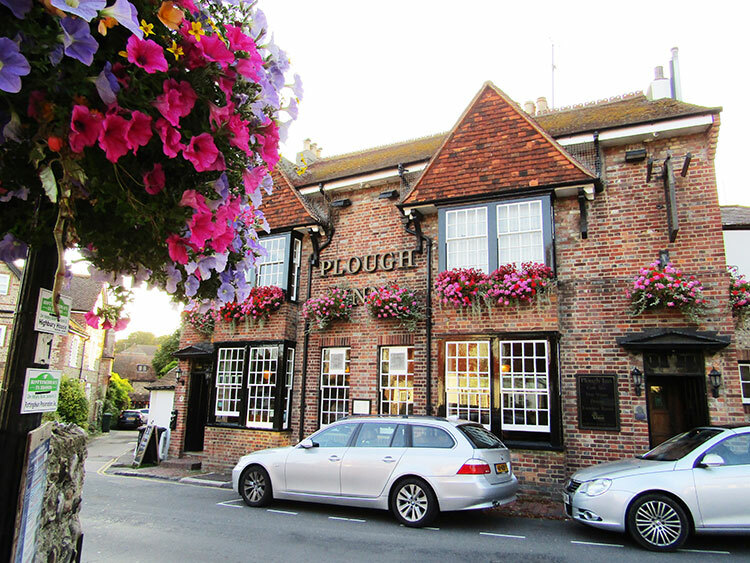 The Plough is the epitome of a traditional British pub, with big bay windows, oodles of wood panelling, a dark wood floor, wooden furniture and an oak beam ceiling. Did I mention the wood? 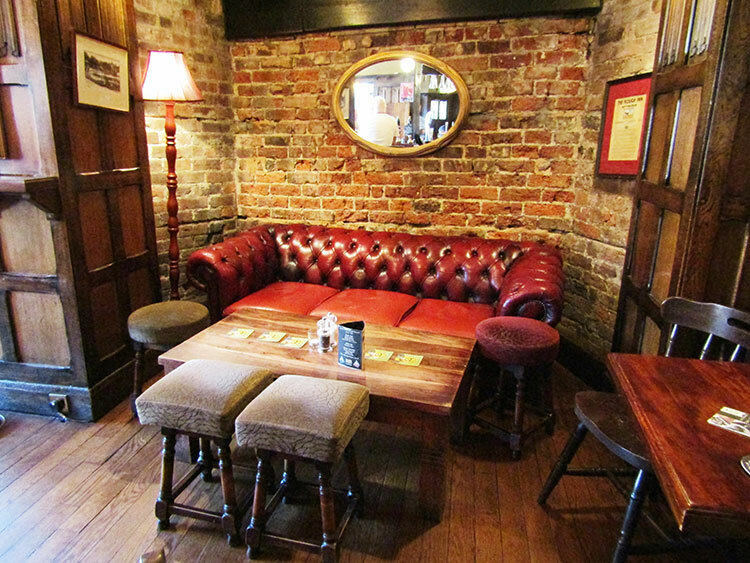 Aside from the main bar area there is also a laid-back nook at one end, complete with a red leather chesterfield sofa, a small brick fireplace and homely standing lamps, and, at the other side of the pub, a slightly more formal little raised dining room. There is also a small white-washed courtyard outside if you fancy a bit of fresh air. It very much comes across as a local’s pub but without the Royston Vasey creepiness, on the contrary, there is an inclusive, welcoming vibe and, on both our visits, the staff and customers were all very friendly. Our mutts were welcome too and received plenty of fuss as well as the odd naughty titbit under the table. The Plough is clearly a cornerstone of the community, as was emphatically evidenced by the weekly meat raffle (Fridays at 7pm) which happened to be in full swing last time we visited. Obviously extremely popular, it was raucous and fun and all in the name of a deserving local cause. If you’re into your music there is also a Jazz club upstairs, on the last Sunday of each month. We arrived for dinner on a glorious summer’s evening and sat by the large sash windows, through which we were treated to a lovely cooling breeze. 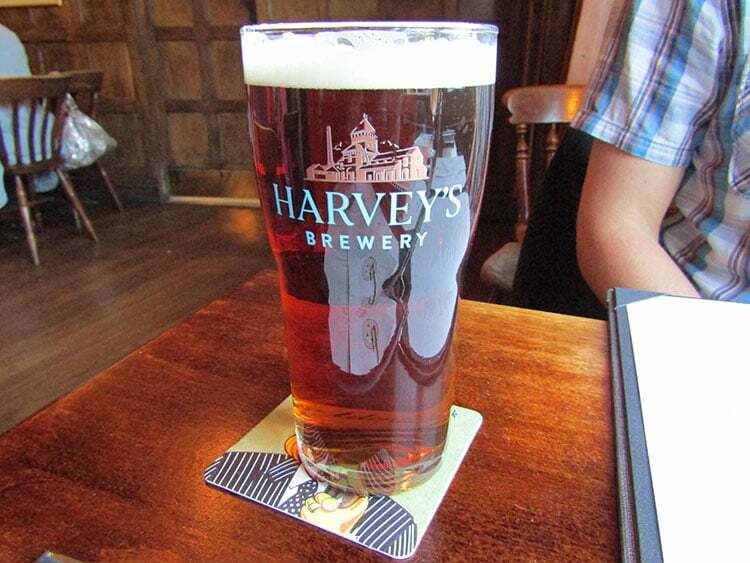 I ordered a large glass of delicate salmon pink La Maglia, an Italian Pinot Grigio Blush, as it seemed like a good summery option, and Andrew had a pint of Harvey’s, a champagne among beers, brewed in nearby Lewes and an absolute local staple. If you’re off the booze or are just in the mood for a cuppa you can choose from a selection of fair-trade coffees, supplied by Brighton based Roasted, or an award-winning tea by Novus. 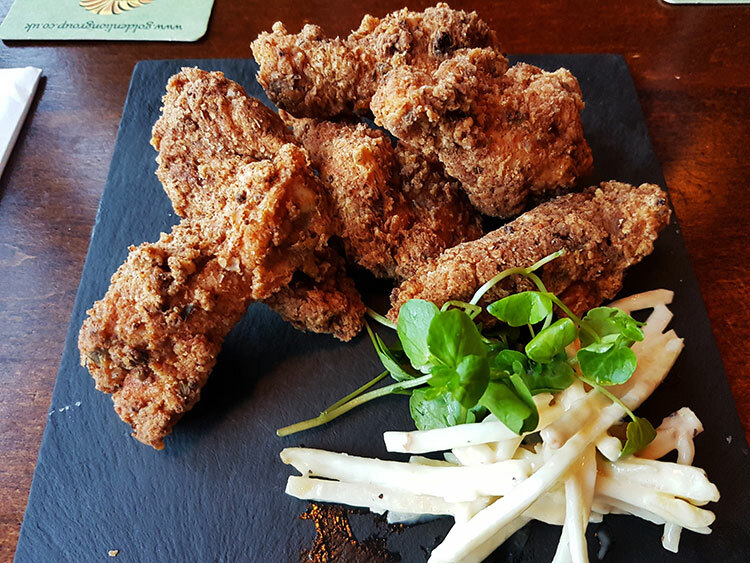 The kitchen crew are proud to use the finest quality ingredients from the best local suppliers and offer a range of bar snacks, sandwiches and fantastic looking deli boards showcasing a tempting selection of delicious meats and cheeses, as well as more substantial plates of traditional pub fare. The tender chicken was covered in a salty, crunchy coating, which was good and savoury but I couldn’t pick up much in the way of “Southern” spices. Rather than being crunchy and tangy, the coleslaw was mild and creamy. I had the heritage tomato and homemade focaccia panzanella salad with avocado purée. There was a lovely variety of tomatoes such as the soft & intense sun-dried, mouth-watering sweet & red, then the slightly sharper yellow, or the firm, unripe apple-flavoured green tomatoes. I was pedantically pleased to note that, where necessary, the tough fibrous part at the base of the stem had been removed. 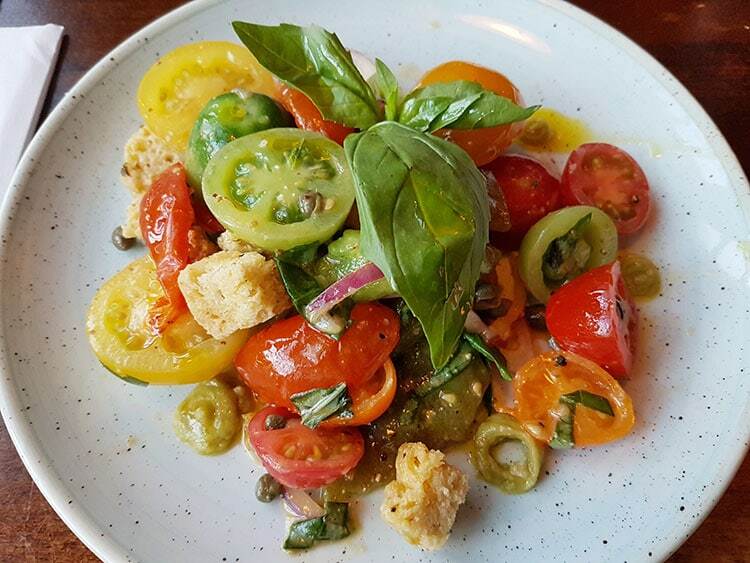 The tomatoes were combined with red onion, capers, peppers, fresh basil, the odd dollop of smooth avocado purée and crunchy croutons, all coated in a sweet tangy dressing and served on a lovely speckled white plate to show off the vibrant colours. For his main Andrew had 45-day aged Sussex rump steak, twice cooked chips, slow roasted Heritage tomatoes and Barkham blue cheese sauce. He asked for his steak rare and it came medium rare, which was close enough and it glistened on the plate, darkly caramelised, well-seasoned, succulent and juicy. The pretty colourful tomatoes were sweet and intense and he received a little jug of blue cheese sauce which had earthy, rich & peppery flavours. 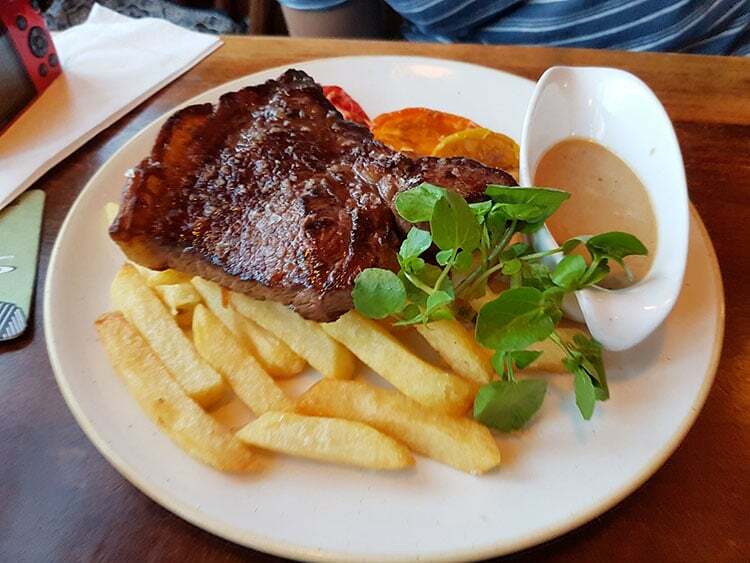 The chips were nice but had gone a little soggy as they had been served underneath the steak. By this time, I had polished off my rosé so I ordered a glass of Satellite, a crisp New Zealand Sauvignon Blanc, to go with my free range Southern fried chicken breast burger. Served on a Flour Pot bakery bun, it came with chips, homemade mayonnaise, tomato, red onion and a pickle. You can add any cheese or charcuterie, fried egg, beer battered onion rings or smoked bacon for £1.50. I opted for the Cornish chilli chorizo. 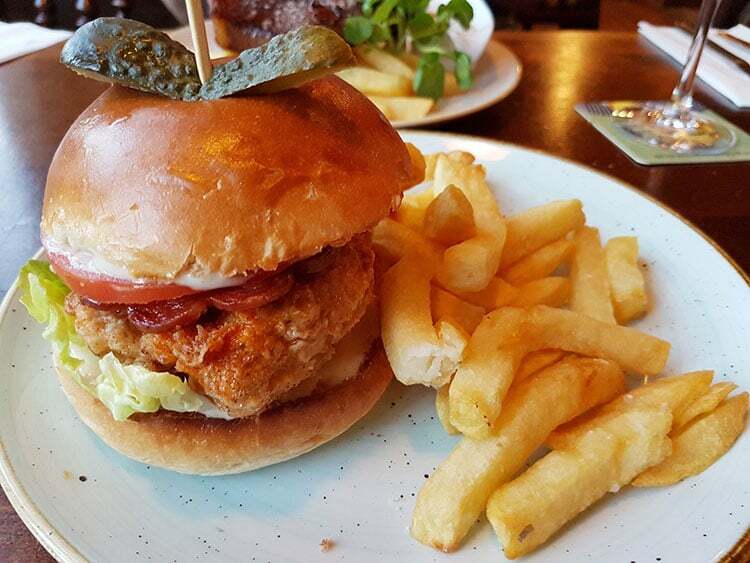 I got a glossy bun, stuffed with a crispy coated, tender chicken breast, fresh salad and a couple of large slices of zingy chorizo with a pickle on top, all held together with a wooden skewer and accompanied by a handful of fabulous golden crispy chips. If burgers are your thing you can get 2-4-1 every Wednesday. 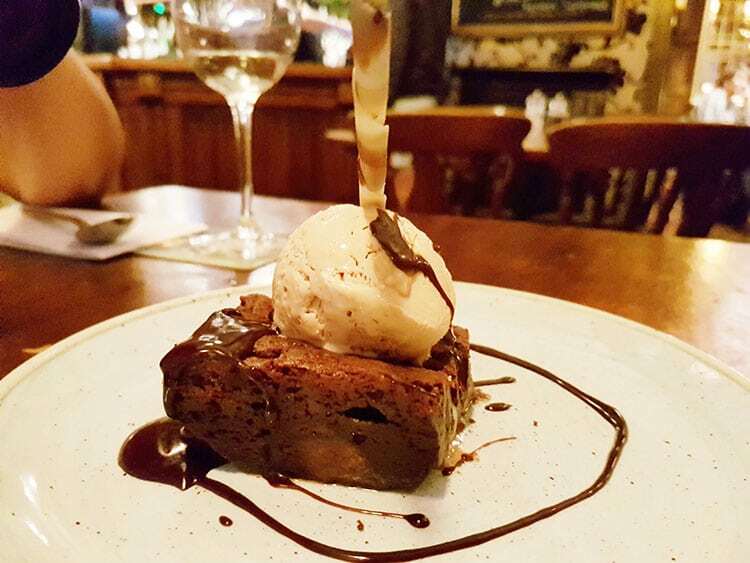 For dessert, Andrew had the dark chocolate brownie with salted caramel ice cream. The brownie was served warm and was sweet and moist. It was topped with a scoop of lovely caramel ice cream and finished with a rich chocolate sauce and a pretty, white and dark chocolate “cigarette” stick. 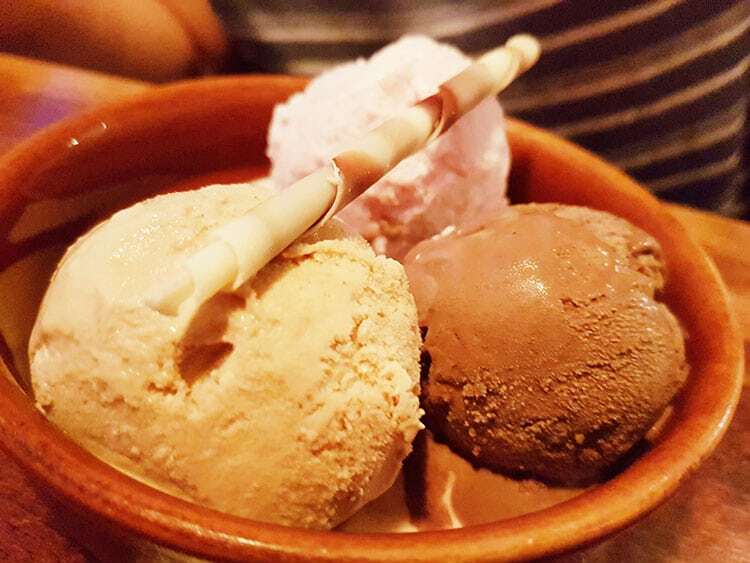 I ordered a trio of ice-cream because, summer! I got a scoop each of chocolate, strawberry, and salted caramel, also finished with a chocolate flourish, and it was just the ticket. The portions aren’t the biggest but with three courses we were comfortably full.